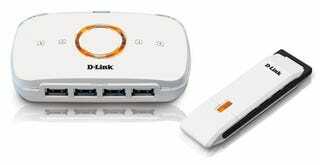 D-Link's DUB-9240 Wireless USB hub was announced today. For non-wireless USB equipped PCs (everything but the Lenovo T61 and Dell Inspiron 1720), the kit includes an adapter, called the DUB-1210. It operates with the four port hub (DUB-2240), which your devices connect to by cable, at the 3.4GHz to 4.5GHz range to reduce interference.